This is a guest blog from Eco Logic, LLC. Thanks to Natalie Marinova, Mary Hallinan, and the other Eco Logic staff for sharing their expertise! Native bees, butterflies, moths, beetles, wasps, flies, hummingbirds, and bats are all part of the cycle of pollination. Understanding the many groups of animals involved in pollination brings into sharp focus the diversity of life that works in connection with one another. Here are some wonderful spring plants that, if welcomed to your yard, will help provide great food and habitat for our native pollinators. Typically thought of as a weed, this plant is one example of an early season nectar source that will flourish in lawns that are not chemically treated. Specifically mason bees, sweat bees and skippers are pollinators, while several species of fritillary butterfly caterpillars use the leaves as a food source. * Great left in lawns or used as a groundcover in shady sites with good moisture. Does best with rich loam soils or clay loam. 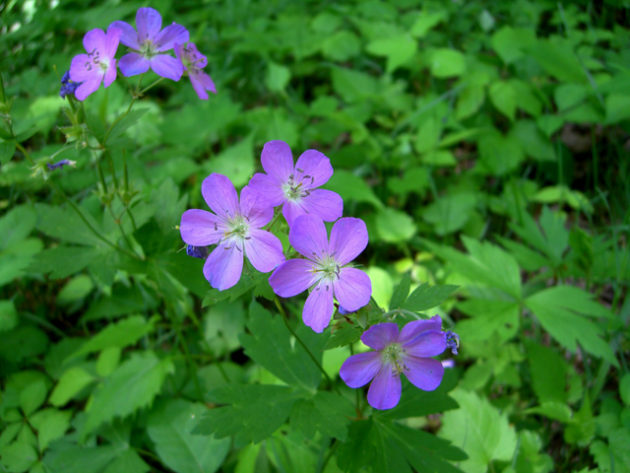 The delicate pink to purple blooms dangle airily above light green foliage, gracing the shade garden with early blooms. Numerous bee species including bumblebees, mason, cuckoo, long-horned, Halictid and Andrenid are attracted to both the nectar and pollen. Flies, butterflies and skippers frequent the flowers as well. Numerous other insects feed on the foliage*. This plant can be known as a pollinator magnet! 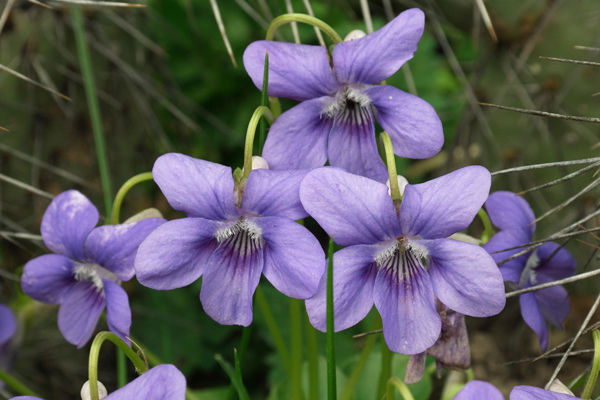 Works well as a front border plant in dry shade gardens or to fill in underneath shrub plantings. Fairly adaptable, but does best in mesic** loam to clay soils. Trees and shrubs are the backbone of home landscapes. Our state was once predominately forested, so encouraging land management with forests as a goal (whether that is by planting or invasive plant management) is a great way to ensure our native pollinators are getting the plants they need. 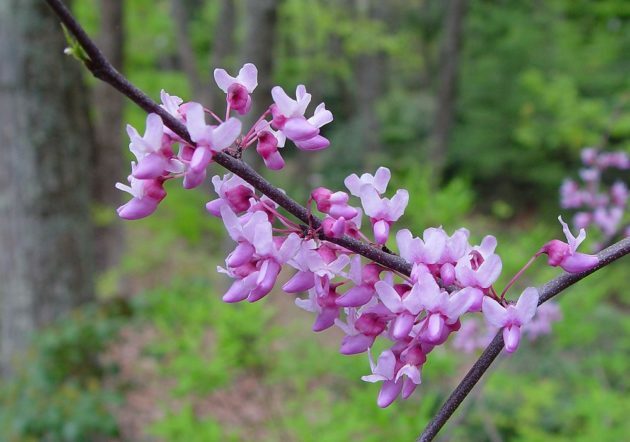 The redbud trees have made a phenomenal show this spring and never disappoint the wide variety of bees that seek out the nectar and pollen. *Several caterpillars of moth and butterfly species feed on parts of the plant. Truly an understory tree, be sure to plant in at least part shade, not full sun. 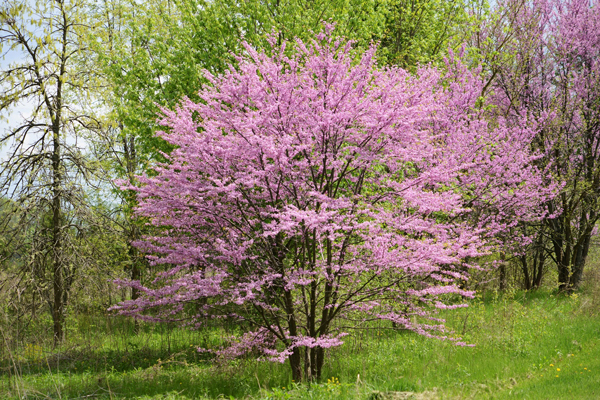 Redbuds do best in clay-loam to loamy soils. While cutting back and cleaning up winter debris, leave some dead standing stalks. Even just leaving some 6-8” stalks of especially hollow-stemmed plants (such as joe-pye weed) can provide much needed nesting sites for bees. Don’t worry about the unsightliness of leaving a few stems, the fresh vegetation will soon cover them up! Leave some areas of bare ground. Open areas of soil can provide ground nesting habitat for bees. Provide some areas for shallow pooling of water. ** Definition of ‘mesic’: (of an environment or habitat) containing a moderate amount of moisture.